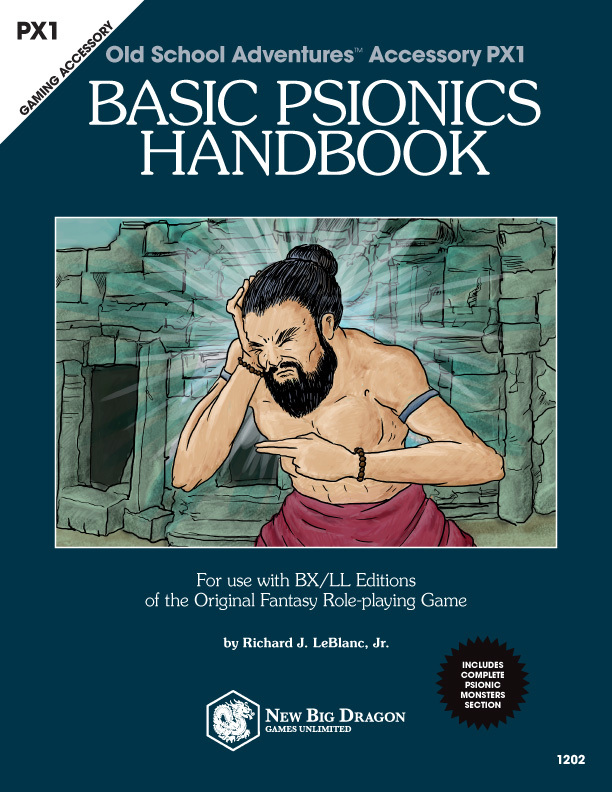 I've been plugging along steadily with my BX mystic class and psionics system (along with a ton of other gaming projects and diversions). But, as of this morning, I'm feeling particularly accomplished. I just finished writing the fifth section of the psionic disciplines. Since I've tried to go back to Steve Marsh's original concept for psionics (mental abilities based on a character class inspired by Indian mystics), the different groups of disciplines (which Steve Winter did a great job of breaking out in 2e's Complete Psionics Handbook) into 6 different chakras (a concept which, IIUC, Steve Marsh originally intended before Tim Kask hacked up the concept in Eldritch Wizardry). From an email I received from Steve Marsh: "Major powers correspond to the chachras and the traditional powers so that each character had a consistent core." 1. 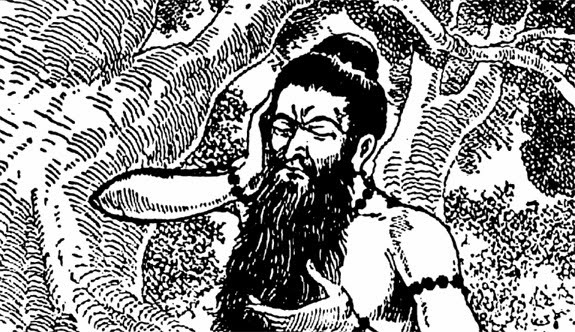 The Root (Psychometabolic) Chakra provides the mystic power over his or her own body, granting control over its physical aspects. 2. The Sacral (Clairsentient) Chakra connects the mystic to knowledge and information, including the past, present, and future. 3. The Plexus (Psychokinetic) Chakra supplies the mystic with dominion over different forms of matter, including its movement and its state of being. 4. The Heart (Telepathic) Chakra provides the mystic the abilities of communication and thought, including control over emotions and desires. 5. The Throat (Psychoportative) Chakra permits the mystic to access other dimensions and allows the mystic to travel through space and time. 6. The Third Eye (Metapsionic) Chakra is accessible only by a mystic who has accessed the the other five. This chakra is interdisciplinary, and allows the mystic to combine the powers and energies of the other chakras. As of this morning, I finished the fifth group of disciplines (throat/psychoportative). That means the following sections are complete: 1) the mystic class, 2) the first five groups of disciplines, and 3) the "optional" psionic combat system. So what's left to write? 1) the third eye/metapsionic disciplines, 2) BX stats for psionic monsters (including the psionic creatures I've written for the Creature Compendium), 3) a "Planar Primer", 4) the "Planar Travel Guide" (planar travel and adventure is HUGE part of Steve Marsh's original concept for the mystic class), and 5) a section on creation and use of astras (supernatural weapons and artifacts related to specific deities, which I see as part of extra-planar adventuring). The book is likely to come in at 40 pages (plus cover), and I feel like I'm about 80% of the way there with the content (even if that leaves a BUNCH of illustrations to do). No target on publication, but I imagine I'll start reaching out for some playtesting in the next few weeks. Updates to follow. I'm trying to get back in the swing of regular d30 Friday posts. I've just been swamped with work lately, and it's really jacking with my schedule. So I'm trying to make up for my d30 slacking with today's 2-parter (separate downloads for each part; scroll down to see them). 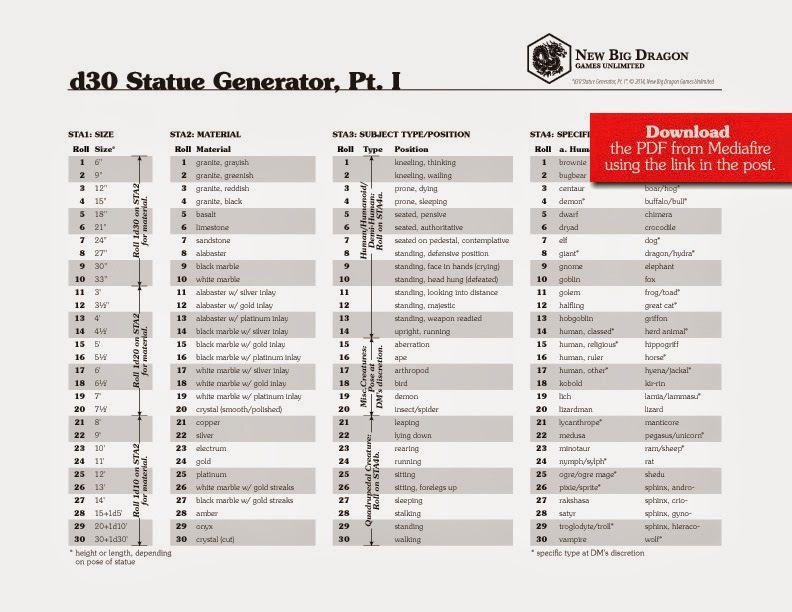 Click here to download a free PDF of d30 Statue Generator, Part 1 page from MediaFire. 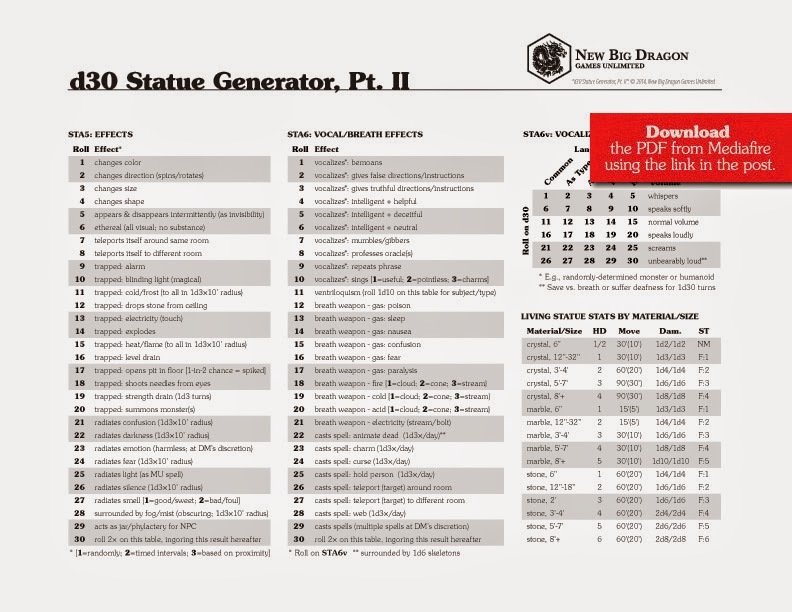 Click here to download a free PDF of d30 Statue Generator, Part 2 page from MediaFire. Given everyone's interest in the ape classes I did a couple of weeks ago, and given that I could see an entire game world using nothing but ape classes, I decided to fill out the classes. I've decided to add siamangs and bonobos. While siamangs are (arguably) just gibbons, and bonobos are a chimp variant, they are each different enough from their related standard types, that some break them out classification-wise. Today is the siamang, and if I get my crap together for tomorrow, you should see the bonobo then. Siamangs are larger species of gibbon, different enough from gibbons to be classified separately. Several features make them distinctly different from standard gibbons. First, siamangs are often twice the size of standard gibbons, having longer, denser shaggy hair, often quite dark in color. Second, the first two digits of each of a siamang’s feet feature a thin connecting membrane. Finally, siamangs have a gular sac, a large throat pouch that can be inflated to the size of its head. This gular sac enables the siamang to make loud, resonating calls and songs. It is this sac (through these powerful calls and songs) that enables them to be quite capable spellcasters. The prime requisite for an siamang is Intelligence. Siamangs with an Intellgigence score of 13 or greater will gain a +10% bonus to earned experience points. RESTRICTIONS: Siamangs determine their hit points using four-sided dice (d4). They may advance to a maximum of 10th level of experience. Siamangs are prohibited from wearing any type of armor or using a shield, and may only use a dagger as a weapon. SPECIAL ABILITIES: Siamangs fight and save as magic-users of the same level, and may use the same magic items permitted to magic users. Siamangs also use spells as a magic-user of the same level and are able to climb trees as a thief of the same level. Like other apes, siamangs are able to swing through trees at a rate equal to their standard movement, and may hang from trees by their arms and use their feet attack and defend with -1 “to hit” and +1 AC penalties (respectively). In addition to common, Siamangs speak the language of apes, and use the sign language understood by apes, but are able to use the sign language “dialect” of gibbons. Beginning at 9th level, siamangs gain the ability to create magic items (as a magic-user). I've often been asked by a couple of folks how I continue to produce so much gaming output. And while I usually answer with a fairly stock answer (which I wholeheartedly believed was the reason), I got a great big confirmation on it this week. My stock answer is this... I have the HUGE benefit of working from home. First off, that means the same computer with my work-work is also the enabler of my gaming stuff, so I can bounce back and forth at will from work files to gaming files. More importantly, my commute is officially the 27 steps from my bedroom to the chair in my office (ironically, it is also 27 steps from my chair to the coffee maker in the kitchen; I counted). My wife gets up early and usually leaves the house by 7 a.m. (she's a teacher and assistant principal). I try to fix her breakfast and pack her lunch every day. That means I'm usually ready to get my day started about 7 a.m. I don't really need to get cracking on work stuff most days until 8:30 or 9. That pretty much means while you're commuting, I'm working on game stuff. And if it's a slow work day, I don't have to look busy until I clock out at 5. I can hop over to one of about a dozen things that are currently occupying my time, and work on those. Now consider I only need about 6 hours a night of sleep (more than that, I'm sleepy during the day) and my wife is usually in bed by 8:30. That leaves me time from about 8:30 to midnight to do... whatever. For the last couple of days, I've been on a photo shoot for a client. Today, the drive from my house to the photographer's studio was about 45 minutes, and the drive home was about the same. Yesterday, I missed a turn because of traffic and the drive to the studio was nearly an hour, and the drive home was almost as bad. In the days of the job I had just before I went back to work for myself (I have worked from home during 2 different distinct career periods), the office I shared with my 2 business partners was near the same part of town as the photographer's studio. It wasn't as far away as the studio, but, at the time, there were massive amounts of road construction near our office (they were installing a new rail line). So even though the office was technically closer, it still took at least 45 minutes each day... each day. Considering a 5-day week, that's 8 hours a week (or more) in traffic. That's a full day's work!!! Plus, take part in a Dallas-area commute any day and you will find yourself mentally drained. The last thing you'll want to do when you get home is to keep working... on anything! Because of this photo shoot, my sum gaming production total for the last two days has been 5 one-sentence-long descriptions for some magic items I intend for the next Dragon Horde zine. I'm just glad I only have one of these photo-shoots every year. Tomorrow my schedule should get back normal. Time is running on on the New Big Dragon/Tenkar's Tavern GenCon Jet Lag Giveaway. the d30 Sandbox Companion .PDF is 33% OFF at RPGNow. I myself wasn't lucky enough to attend GenCon this year, and given that it seems to fall during my busiest client month of the year, I imagine that may continue to be the case for a while. So, in honor of my jealousy of those who did get to go this year, and the many of you who traveled yesterday and are traveling today, I'm doing a couple of GenCon Jet Lag thangs. First off, I'm doing another d30 Sandbox Companion Flash Sale on the PDFs at RPGNow. Get the PDF for $3.95 (33% off the standard price) until Tuesday night at midnight CST. Welcome to the fourth and final post of the "Ape Week" intelligent animal character classes. Monday was the chimp. Tuesday was the gibbon. Wednesday was the gorilla. And today is the Orangutan. Orangutans are deep-thinking apes who have dedicated themselves to the “larger mysteries of life” (usually through service to a diety or dieties). Like human clerics, orangutans must prove themselves worthy before gaining spellcasting abilities and, therefore, do not attain their first spell until reaching 2nd level, at which point they gain new spells as clerics. The prime requisite for an orangutan is Wisdom. Orangutans with a Wisdom score of 13 or greater will gain a +10% bonus to earned experience points. RESTRICTIONS: Orangutans determine their hit points using six-sided dice (d6). They may advance to a maximum of 10th level of experience. Orangutans may wear any type of armor and may carry a shield, but may only use blunt weapons. SPECIAL ABILITIES: Orangutans fight and save as clerics of the same level, and may use the same magic items permitted to clerics. 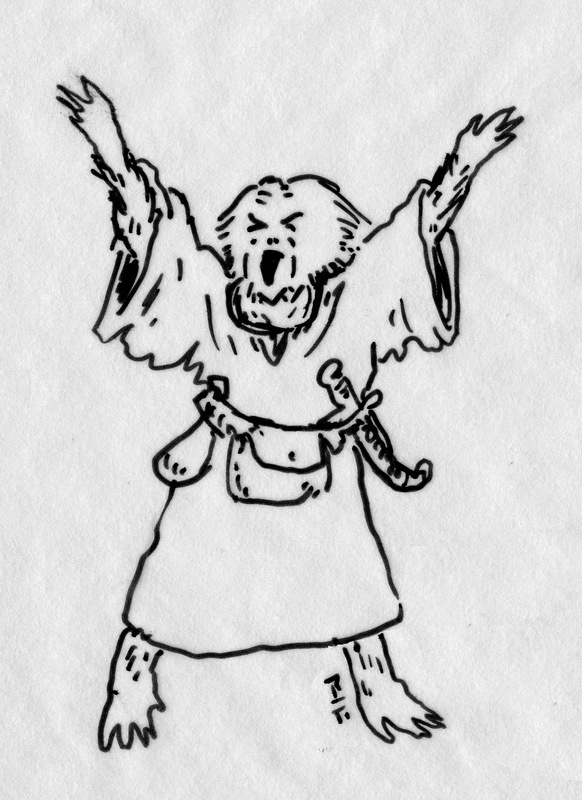 Orangutans also use spells as a cleric of the same level, but do not possess the ability to turn undead. 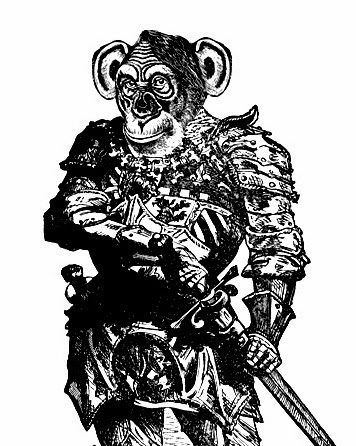 Orangutans are able to climb as a thief of the same level, but suffer a 1 level penalty if wearing chain armor, and a 2 level penalty if wearing plate armor. They may also move through trees (by swinging) at a rate equal to their standard movement if wearing leather armor less, half movement if wearing chain, and one-third movement if wearing plate. Furthermore, like all apes, orangutans may hang from trees by their arms and use their feet to wield weapons and bear shields, with -1 “to hit” and +1 AC penalties (respectively). In addition to common, organgutans speak the language of apes, and utilize a secret form of sign language understood only by other apes (including gibbons). Beginning at 9th level, an orangutan with enough money may establish a “congress,” of 20-100 orangutans. Once assembled, rulership of the congress will be by an equal vote of all its members. The orangutan that established the congress will act as its leader only as long as the pouplution of the congress continues to elect him or her. Welcome to day 4 of "Ape Week" with the intelligent animal character classes. Monday was the chimp. Yesterday was the gibbon. Today is the gorilla. And tomorrow will be the Orangutan. Gorillas are fierce and fearless warriors, and rarely fail to instill dread into any opponent they face. The prime requisite for gorillas is Strength. Gorillas with a Strength score of 13 or greater will gain a +10% bonus to earned experience points. RESTRICTIONS: Gorillas determine their hit points using tend-sided dice (d10) They may advance to a maximum of 12th level of experience. They may wear any type of armor and use a shield, and may utilize any type of weapon. SPECIAL ABILITIES: Gorillas are able to employ two single-handed weapons at the same time (making a separate “to hit” roll for each, and eliminating the ability to use a shield at the same time). Gorillas fight and save as a fighter of the same level. Gorillas are able to climb as a thief of the same level, even while wearing chain or plate armor. They may also move through trees (by swinging) at a rate equal to half their standard movement (assuming the branches of the trees are strong enough to suppor their weight). Like all apes, gorillas may hang from trees by their arms and use their feet to wield weapons and bear shields, with -1 “to hit” and +1 AC penalties (respectively), and may wield two-handed weapons in this manner with a -2 “to hit” penalty. In addition to common, Gorillas speak the language of apes, and utilize a secret form of sign language understood only by other apes (including gibbons). Beginning at 5th level, gorillas are able to use a gaze attack that will stun an opponent for 1d4+1 rounds (on a failed saving throw vs. paralysis). This gaze attack may only be made against opponents which the gorilla has engaged in melee, but may be made in addition to any other attacks the gorilla makes for the round. If the gorilla makes any melee attacks for the round, the gaze attack must be made against one of the gorilla’s melee opponents. This ability may only be used once per round against a single opponent. Beginning at 10th level, a gorilla may assemble a troop of 10-40 apes. 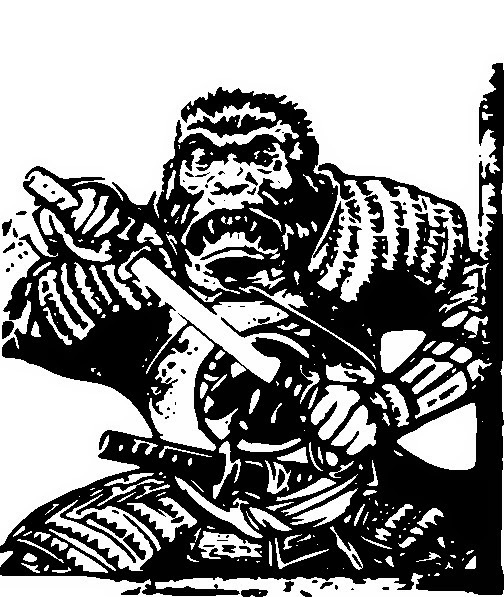 This group will live nomadically and be run as a khanate, with the strongest gorilla acting as the group’s leader. Welcome to day 2 of "Ape Week" with the intelligent animal character classes. Yesterday was the chimp. Today is the gibbon. Wednesday will be the gorilla. And Thursday will be the Orangutan. Gibbons are graceful and nimble, with a high-level of manual dexterity, particularly suited to thieving abilities. The prime requisite for gibbons is Dexterity. Gibbons with a Dexterity score of 13 or greater will gain a +10% bonus to earned experience points. RESTRICTIONS: Gibbons determine their hit points using four-sided dice (d4) They may advance to a maximum of 8th level of experience. They may wear nothing more protective than leather armor, and may not use a shield. They may use any weapon of normal or small size, but may not use long bows or two-handed swords. 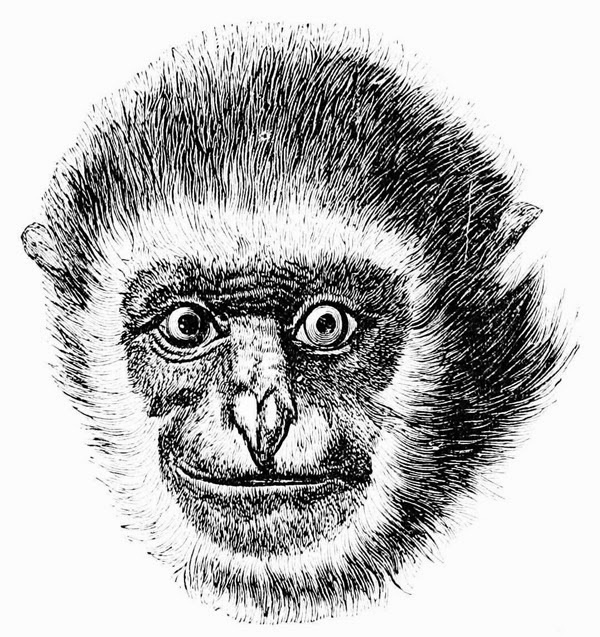 A gibbon character may not have a strength score higher than 12. SPECIAL ABILITIES: Gibbons possess theieves’ abilities as a theif of the same level. Furthermore, they fight and save as a thief of the same level. Like other apes, they are able to swing through trees at a rate equal to their standard movement, and may hang from trees by their arms and use their feet to wield weapons with a -1 “to hit” penalty. In addition to common, Gibbons speak the language of apes. Ironically, while their hands are particulary suited to thieving work, their morphology limits their signing ability. While they easily understand the sign language of apes, there is only a 70% chance that when signing to other apes (including other gibbons) that they’re meaning will be understood correctly. Gibbons do, however, have a “dialect” of this sign language particular to gibbons, which will be understood 100% of the time by other gibbons. It's going to be "Ape Week" this week with the intelligent animal character classes. Today is the chimp. Tomorrow is the gibbon. Wednesday will be the gorilla. And Thursday will be the Orangutan. Chimps are intuitive problem solvers and tinkerers. They’re good-natured and generally outgoing, but often find themselves running from a fight, rather than facing it. While chimps are among the most loyal of beasts, leadership rarely suits them. The prime requisite for chimps is Strength. Chimps with a Strength score of 13 or greater will gain a +10% bonus to earned experience points. RESTRICTIONS: Chimps determine their hit points using six-sided dice (d6) They may advance to a maximum of 8th level of experience. They may wear any type of armor and use a shield, and may utilize any type of weapon. A chimp character must have an Intelligence score of at least 9. SPECIAL ABILITIES: Chimps are incredibly insightful, and are able to detect traps and secret doors a third of the time (roll of 1-2 on 1d6). Chimps have better saving throws than most other apes, and fight and save as a halfling of the same level. Chimps are able to climb as a thief of the same level, even while wearing chain or plate armor. They may also move through trees (by swinging) at a rate equal to their standard movement. Like all apes, chimps may hang from trees by their arms and use their feet to wield weapons and bear shields, with -1 “to hit” and +1 AC penalties (respectively). In addition to common, chimps speak the language of apes, and utilize a secret form of sign language understood only by other apes (including gibbons). Upon reaching 8th level, a chimp with enough money may choose to build a tree fortress/stronghold. The chimp will attract from 1-10 groups of 2-8 chimps each as part of a “troupe.” While this group will have a loose hierarchy, it will have no true leader, and members will fluidly move from subgroup to subgroup. If there are other troupes in the area, a certain level of hostility will exist bewteen these communities. Below is a continuation of my posts of "Type B" intelligent animals (which are slightly anthropomorphic, as opposed to the "Type A" versions which are simply talking versions of the normal animal type). So far, most of the level limits have been fairly low (e.g., Wolverines and Foxes are limited to 8th level, and Cats are limited to 6th). But something about lions (and their fabled history) suggests a higher level limit (or possibly no limit at all). The XP/Level chart below has the XP ranks based on a limit of 12th level. Should I go with unlimited levels for lions, then I'll definitely have to recalculate. Lions are among the strongest and bravest warriors that have ever lived. They are equally fierce, wise, and inspiring, making them natural leaders. The prime requisite for a lion is Strength. Lions with a Strength score of 13 or greater will gain a +10% bonus to earned experience points. RESTRICTIONS: Lions determine their hit points using ten-sided dice (d10). They may advance to a maximum of 12th level of experience. Lions may use any type of weapon, any type of armor, and may use shields. A lion character must have minimum scores of 9 in both their Wisdom and Charisma. SPECIAL ABILITIES: Lions fight and save as fighters of the same level, and may use the same magic items permitted to fighters. Lions are natural commanders. When in command of a relatively small (2-20) group, all members of the group receive a +1 bonus to their morale (in addition to any morale bonuses due to the lion’s Charisma score). Beginning at 5th level, a lion is able to issue a battle roar once per day that inspires a small group under his command, providing those making melee attacks with +1 “to hit” and damage bonuses, and providing a +1 “to hit” bonus (but no damage bonus) to other forms of attack by members of the group. This bonus lasts for a number of rounds equal to the lion’s level. At higher levels, a lion with enough money may establish a stronghold. 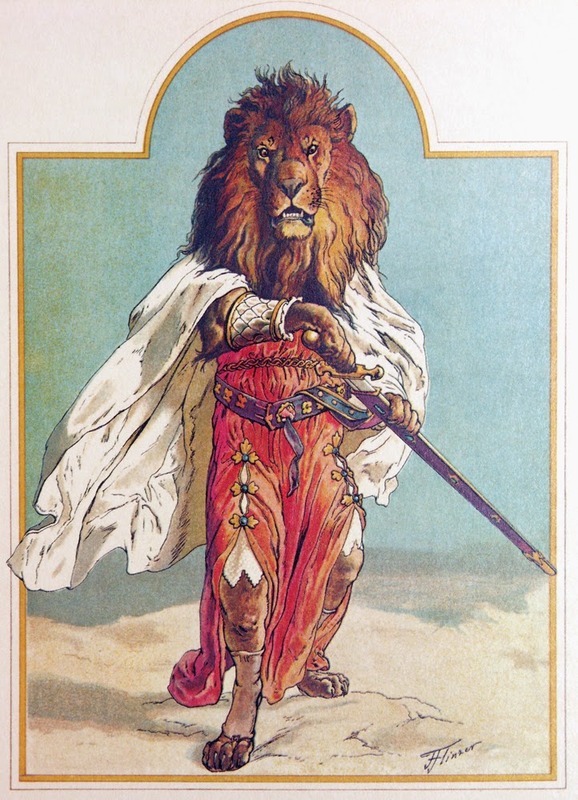 Beginning at 9th level, a lion character may establish a barony. Unlike human baronies, the lands of a lion’s barony need not be cleared, as many of the subjects of the barony will be animals who choose to reside in natural habitats. The following is meant to be what I call a "Type B" intelligent animal (which are slightly anthropomorphic, as opposed to the "Type A" versions which are simply talking versions of the normal animal type). If you've missed the previous two posts, so far I've done wolverines and foxes. 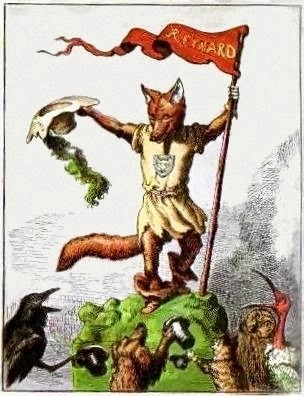 Unlike foxes who tend to be conniving tricksters (with their own personal goals in mind), cats tend toward being “helpful” tricksters, often lending their manipulative and brazen personalities to aid others in finding success. The prime requisite for a cat is Dexterity. Cats with a Dexterity of 13 or greater will gain a +10% bonus to earned experience points. RESTRICTIONS: Cats determine their hit points using four-sided dice (d4). They may advance to a maximum of 6th level of experience. Cats may may not use armor and they may not use shields (as either of them tends to hinder many of the cat’s natural abilities). Though cats generally prefer to use swords, they may use any weapon of normal or small size, but may not use long bows or two-handed swords. A cat character may not have a strength score higher than 12. Sneak: This is akin to both a thief’s ability to move silently and hide in shadows, permitting a cat to do both at the same time. Additionally, if a cat strikes unnoticed from behind, he or she does so with a +3 “to hit” and damage bonus on the attack. Climb: This ability permits a cat to climb sheer surfaces. A check for success must be made every 100'. If the check fails, the cat will fall from a distance halfway up the surface. Fall: Due to an uncanny sense of balance, cats are able to reduce the amount of damage they incur from falling. For each experience level, the cat ignores 10' of falling damage, and only takes 1d6 per 20' of falling damage. For example, a 3rd level cat falling 90' would ignore 30' of falling damage, and only take 3d6 damage from the other 60' of falling. Catwalk: This ability permits a cat move across very narrow surfaces at their normal movement rate (even with running/fleeing). The cat is able to walk across the indicated width for their level without any chance of falling. Dodge: Cats are able to attempt to dodge any hand-thrown weapon (including daggers, darts, and slings). On any successful “to hit” roll made agains the cat with this type of attack, if the cat rolls the indicated percentage or less, the strike is completely avoided. 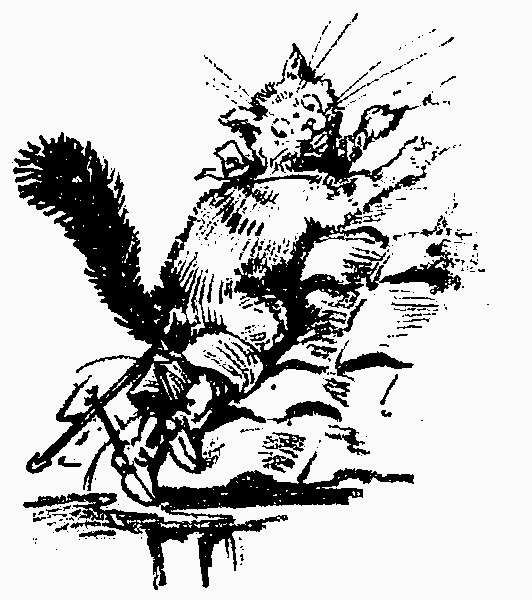 The DM should use his or her discretion as to where the strike will land if the cat successfully dodges the attack (e.g., it might hit a character or creature standing behind the cat). This ability does not work against bows or crossbows. Sympathy: A cat is able to protrude his or her eyeballs slightly, making them seem larger and “sad,” in an attempt to gain sympathy from another character or creature. 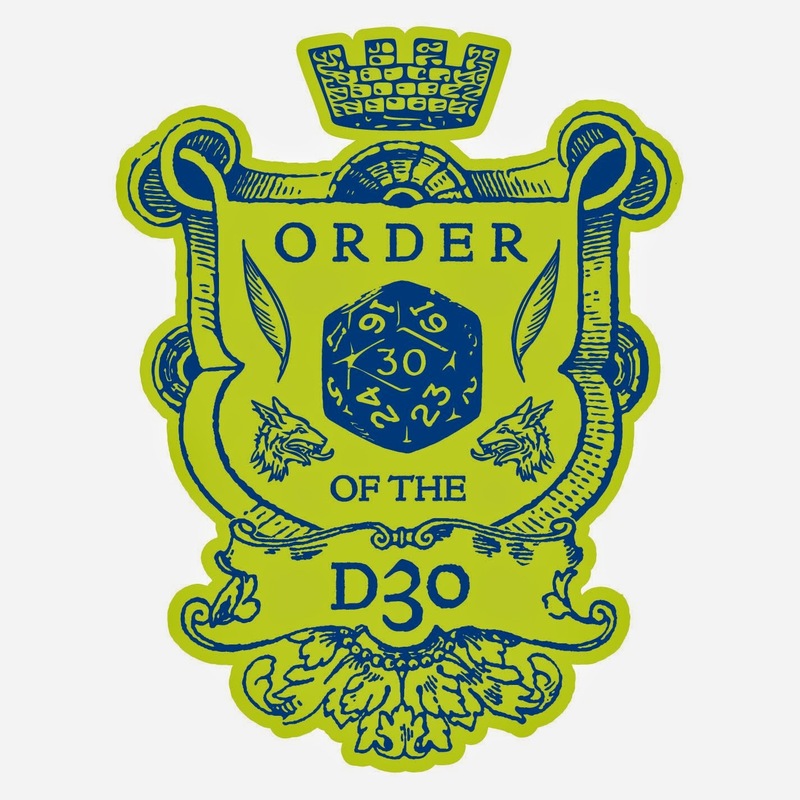 After any undesirable reaction roll, the cat may use this ability against the creature or character in question, forcing the DM to re-roll the reaction roll with a bonus equal to the level of the cat. The cat is able to use this ability a number of times a day equal to his or her level. For example, a 4th level cat may use this ability 4 times a day, gaining a +4 bonus on the reaction roll each time it is used. Nine Lives: All cats begin with nine lives. Should a cat lose a number of hit points such that the character would be dead, all of the cat’s hit points are immediately restored, and the number of extra lives possessed by the cat is reduced by one. The following is meant to be what I call a "Type B" intelligent animal (which are slightly anthropomorphic, as opposed to the "Type A" versions which are simply talking versions of the normal animal type). This is also what I hope to be the first of a daily series of posts in which I write up a new animal class for each post. Wolverines are stocky, muscular and fearless, rarely backing down from even the most overwhelming opponent. The prime requisite for a wolverine is Strength. Wolverines with a Strength of 13 or greater will gain a +10% bonus to earned experience points. RESTRICTIONS: Wolverines determine their hit points using eight-sided dice (d8). They may advance to a maximum of 8th level of experience. Wolverines may use any type of armor and may use shields. They may use any weapon of normal or small size, but may not use long bows or two-handed swords. A wolverine character must have a minimum Constitution score of 9. SPECIAL ABILITIES: Wolverines are of sturdy build and, therefore, make saving throws as a dwarf of the same level. Additionally, due to their hydrophobic fur, wolverines receive a +1 bonus to all saving throws vs. cold, and all cold damage they take is reduced by 1 point per die of damage. 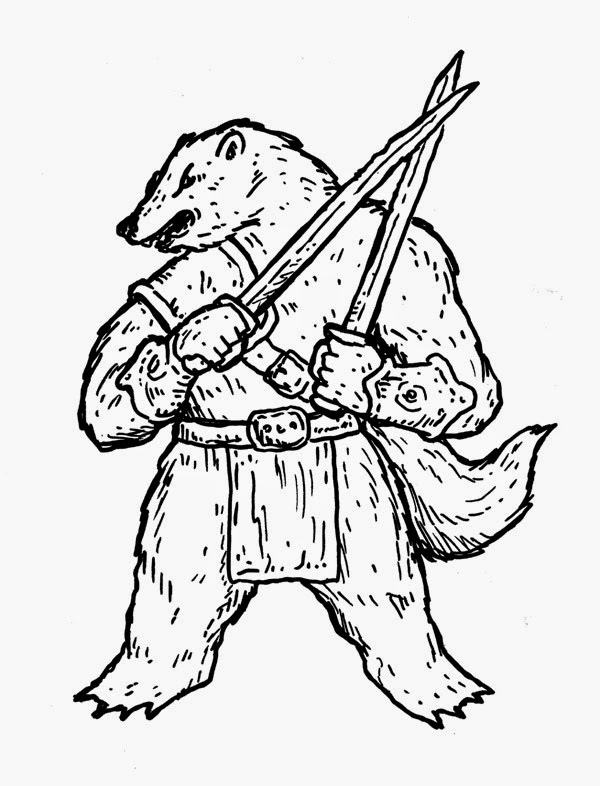 Wolverines possess a battle rage similar to berserkers. This allows them, when facing more than one opponent at a time, the benefit of making “to hit” rolls vs. a single opponent with a +2 bonus, or to make two attacks each round (without the “to hit” bonus). Wolverines use the same attack tables as fighters. In addition to common, wolverines speak the language of mustelidae (weasels) and are, therefore, able to speak with otters, badgers, weasels and ferrets. This is one of those where the title says it all. d30 Misc. 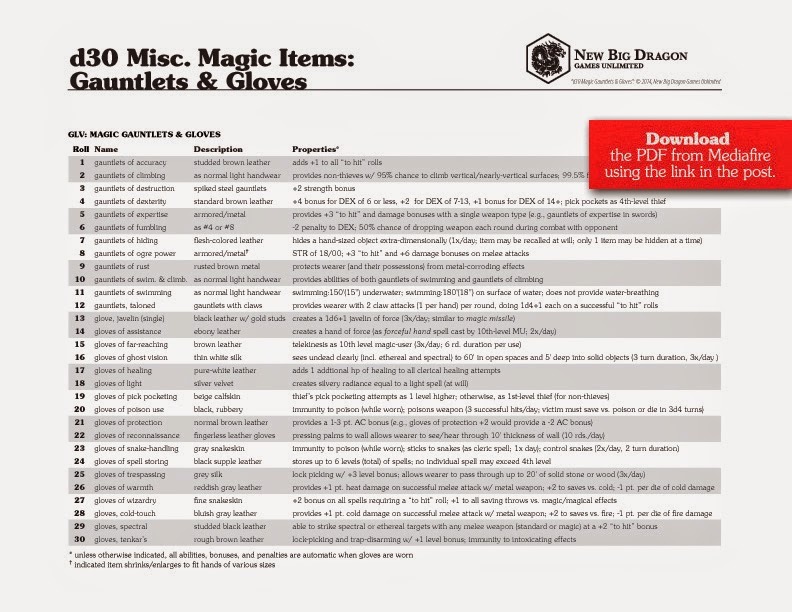 Magic Items: Gauntlets & Gloves page from MediaFire.